In November 2016, a paper appeared in the scientific journal Science Advances, published by the American Association for the Advancement of Science. The authors, all graduates of the University of California, have been looking at how three of the most common types of plastic acquire a coating of a chemical – Dimethyl sulphide or DMS – that produces an odour many organisms associate with their natural food. According to the authors, Savoca, Wohlfeil, Ebeler and Nevitt, this process can occur within just one month of the plastic’s exposure to sunlight as it floats in seawater. DMS is produced by microscopic organisms (algae or bacteria) that cling to the plastic debris floating in our seas, thereby making all kinds of manmade items not only look like natural food but also, as it turns out, smell like it as well! Although the study concentrated on seabirds – frequently victims of starvation due to litter ingestion – many other marine organisms (from sea turtles to baleen whales) that use scent as one of the markers that identifies something as either “edible” or “inedible”, are equally at risk. 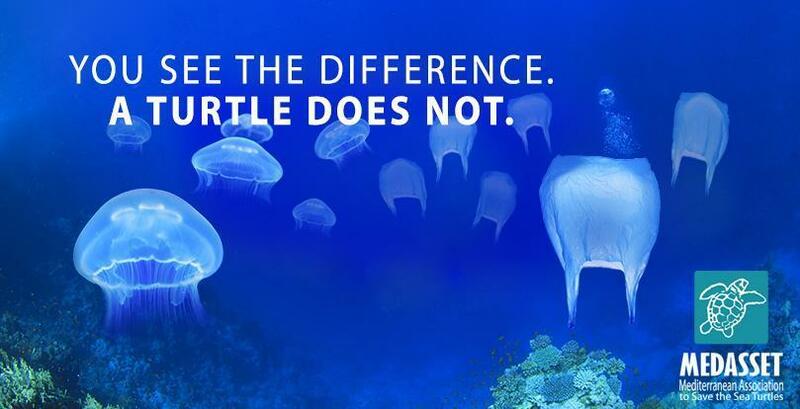 MEDASSET has been warning of the dangers posed to sea turtles by plastic bags that look like jellyfish since 1994 and our poster highlighting this issue has now spread across the globe where it is used by over 15 aquaria and museums to raise public awareness of the problem. This new research shows that it is more vital than ever that we should redouble our efforts to restrict the amount of plastic litter reaching our seas.